Extraction of fossil fuels is a direct threat to perdurance of small indigenous peoples all over the world. This theme goes as a red line through all presentations of the representatives of indigenous peoples at the events within the frame of the UN climate negotiations in Marrakech. While the mass media’s attention has almost entirely shifted to the discussion of the U.S. election, the fact that it is exactly the unwillingness of certain countries to switch to the no-carbon way of development causes tragedies in traditional communities stays beyond the discussion borders. Advocates of the ancestral lands of the Sioux tribes in the State of North Dakota keep talking about this, as do representatives of small indigenous peoples of Russia and the entire world. 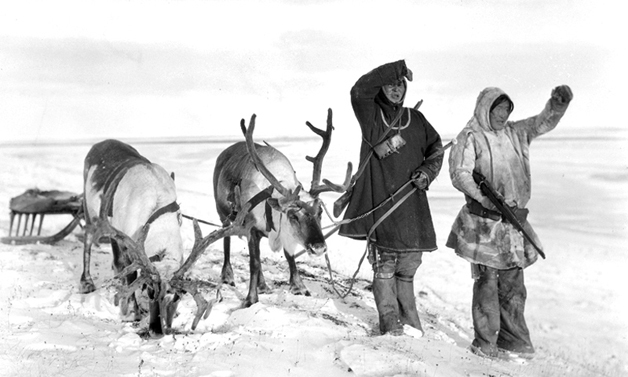 Russia accounts of 41 small indigenous peoples with total population of about 240 thousand people. Small indigenous peoples are present in 34 regions of Russia. Russian participants presented some statistics within the frame of the Day of Small Indigenous Peoples in Marrakech which showed that in Russia about 90% of forests, 100% of diamonds, and 90% of oil and gas deposits are located in the ancestral lands of small indigenous peoples. This is exactly what stipulates the conflict between increasing extraction of natural resources within the frame of the carbon economy and preservation of natural and cultural values, and de-factor perdurance of the local population. For a community to be included in the list of small indigenous peoples, the following four conditions should be met: the number of individuals under 50 thousand persons; compact habitation in the traditional area; preservation of the traditional way of life, and ethnic and cultural identity. Climate change and direct impact of the extractive industries put under the threat all the four points stipulating preservation of the ancestral identity of small peoples. Small indigenous communities feel the negative outcomes of the climate change pretty acutely, as long as their entire style of life is based on following unaffected natural cyclic modes and the forecasts of natural phenomena based on meteorological conditions and behavior of animals which their activities of daily life are connected to. For instance, due to the warming (which in Siberia is two or three times stronger that the world average) the snow cover regime alters; the snow melts, then freezes again, and deer cannot reach the reindeer lichen from under the ice, starve, and wound themselves in the attempts to break the ice, thus significantly increasing death rates of weak animals, one-two year-old deer and she-deer, pregnant does. The ice formation regime is also changing. Yukagihr hunters cannot timely start hunting at their plots. Communications between remote settlements is getting more difficult in the areas where in the past one could walk over the ice, and connections with the “mainland” is getting more difficult as well. Cases of accidents and traumas caused by the unstable ice cover have got more frequent. Spring and fall floods are getting stronger and cause tremendous coast erosion. The composition and numbers of species of commercial fishes and animals, as well as their migration routes, change. Last season, omuls had never showed up in the rivers of two Taimyr regions; earlier, this species had been the main commercial one. Due to non-traditional weather, mosquitoes and other insects vanished which caused extinction of fish juveniles that were fed on them, and the amount of fishes had additionally reduced. Due to the warming, earlier unknown vegetation started to emerge; squirrels had “come” but lemmings, the main catch of polar foxes, disappeared. Polar foxes went away and local hunters have neither furs, nor means for natural exchange or money for the support of their families. In their search for food, wild deer go way, trampling down grazing lands for home-grown deer. Due to reduction of the population of the wild deer, wolves’ attacks on home-grown deer and field settlements frequented. Permafrost thawing is fraught with a whole series of negative outcomes. First, in the result of this process, methane is released, and it is a greenhouse gas is 23 times stronger than carbon dioxide, which in its turn, only aggravates the climate change in the region. Due to the thawing, burials of people and animals come onto the surface and erode. The more and more frequent occurrence on mammoth bones started to attract “black paleontologists” (illegally obtaining remnants and other extracted natural objects for gaining company profits). Traditionally, collection of mammoth bones was prohibited in the indigenous communities. Mammoths impersonated sleeping spirits of the lower world and extraction of their bones meant opening the road to these wicked spirits. Many patriarchs see the things happening as very symbolic changes, especially so in the context of the changing environment and worsening of living conditions. Wash-outs of burials of people and animals who had died of terrible diseases unknown to contemporary peoples cause an even more grave problem. There exists a real danger of virus spreading out due to exposure of remnants of people who had died hundreds years ago of plague and smallpox. Already in 2016, a major outbreak of Siberian plague (anthrax) has happened in Jamal; it was caused by a virus received from an ancient animal burial. In the result of countering the outbreak hundreds of deer were killed, hundreds of people moved to different locations, and one child died. Permafrost thawing causes destruction of the building peers and the necessity of additional migration of local population. Many residents cannot think of living out of their traditional settlements; they cannot adapt to the artificial conditions of townships. In the situation when traditional industries are not available and traditional crafts could not be implemented, unemployment grows along with alcoholic addiction and death rates. Extraction of fossil fuels endangers traditional way of existence and health of the environment in no less extent. Pipelines laid by oil and gas companies make barriers on the traditional migration routes of wild deer. The smoke caused by the Norilsk Nickel Company’s activities scares deer and pollutes the air. Natural landscapes in the extraction zones have been disturbed and contaminated to the degree beyond recognition. Many representatives of the indigenous peoples of Russia support signing of the Paris Agreement and anchor their hopes on it in terms of protection of their territories and communities. Some of them already have the experience of participating in projects carried out within the frames of the Kyoto Protocol “flexible mechanisms” operation. One of the examples of the kind is the Russian-German project carried out in the Far East, in the area of Udegei living. In the result of the project, according to representing it Rodion Sulyandziga, director of the “Center for Support to Small Indigenous Peoples of the North,” they had managed to spare two million hectares of the unique Bikinskaya Taiga from commercial cutting. Mr. Sulyandziga (along with the RSEU Climate Secretariat) very much greets the fact that the Paris Agreement speaks about the necessity to protect “all forests” which includes boreal forests as well, and not only tropical ones as was the case with the Kyoto Protocol. At the same time, representatives of organizations of small indigenous peoples from the countries with tropical forests, who had experienced all the outcomes of the “flexible mechanisms,” warn about the serious threat for the ecosystems and indigenous population caused by implementation of projects of so-called compensation of carbon dioxide emissions at the account of forest planting and reduction of forest degradation. Practically unanimously they speak against the “vicious system” of emission compensation which allows the damage makers to evade direct measures for emission reduction and due to the drawbacks of the system in the form of the double offset and etc. get the unjustified units for reduction which often does not mean any factual emission reduction whatsoever. The system of “compensations” and trade of carbon units and “carbon credits” is subordinate to its economic laws, while a project within the frame of such mechanism is a commercial project focused at making profit and unlimited growth in the future. In many cases such projects had led to “forest planting” in the form of bio-technological cultures plantations in place of the destroyed old forest. Interested parties gained profits on the timber sold in addition to the “carbon credits” for the “forest planting.” Organizations of the small indigenous peoples and many NGOs stress that such plantations in no way could be considered as forests and they should not be included in the mechanisms of the new agreement. It is also necessary to provide for agreements and respect for the rights of local communities in order not to allow a conflict between their interests (which often means mere provision of basic means of living) and corporate interests of companies participating in the projects within the frames of the Agreement mechanisms. Many organizations, for example, the international “Friends of the Earth,” speak against existence of such schemes and the system of emission sales and carbon markets as such. Other ones are more optimistic and allow existence of such market mechanisms but stress that those should be no more than a transition means to be eliminated at a certain stage, but so far can exist for the support of economic “stimulating” of the true emission reduction. Both Russian and foreign representatives of small indigenous peoples agree that within the frame of the Paris Agreement there should exist mechanisms for the support of adaptation for negative impacts of climate change. There should be included a point speaking about protection of small indigenous peoples’ rights which should ignite development of the national law providing for protection of indigenous populations in the regions in course of the implementation of the Agreement mechanisms. Within the UN frames, the group of representatives of small indigenous peoples of the earth had unanimously disapproved Dakota Access pipeline laying supported by D. Trump. Russian representatives of small indigenous peoples also speak about the necessity to reduce and stop extraction of fossil fuels countrywide and develop renewable energy sources in order to survive.